In some ways I'm very conflicted about this release, but in others, I'm very happy because it's a different perspective of the series events, and a great way to celebrate 20 years for a great mystery anime. I don't think this is a perfect special by any means, as there are things that could have been left out, and it doesn't come off as an obvious attempt at retconning or trying to portray that Gosho had this planned out, and that's part of my discomfort with this special. There are so many things that Gosho never would have introduced in the first episode, and it just feels a little weird. The anime seems to be a mixed batch between anime canon and manga canon, and despite the fact that Gosho had been directly involved or "supervised" this special, I wouldn't be so ready to accept everything in here as canon. Should you watch this in place of the first episode or as an introduction to the series? No, absolutely not, but it's a great treat for the fans, or at least I think... and if you're no stranger to the series, absolutely give it a go, because it's a good watch. The story sets off a bit more focused, instead of just tossing us in like the original episode did, which was messy. I think this special does show us everything that was lacking from the early anime, and clears a lot of things up. Having a bit more with Gin, Vodka, and Shiho was nice, as well as the Karate tournament between Ran and Hina, however, there are other character reveals in this special that otherwise seem to contradict canon, don't make sense because of the technological advancements between 96 and 2016, or just should have been left out to reduce clutter. We didn't need to see "those" characters. If you can get past that, this 1 hour and 30 minute special is paced very well, leading up to Shinichi's big shrink and his arrival to the detective agency. We are then treated to some defining moments in the series via recap, a couple anime original moments, as well as an end bit with Shiho changing Shinichi's status to dead. Episode One feels very concise, properly planned and properly executed. I'll give the story a 9/10. The art and animation is nothing mind blowing, but there are many scenes throughout this special that look phenomenal compared to the TV anime's current standards. I'll always be a bit biased, as many people think this style looks hideous, but I've always had a soft-spot for the art in this series, and it's one of my favorite anime to look at. The series never really requires amazing animation, but it's certainly above average here and warrants an 8/10 from me. Voice acting, again, is perfect. Detective Conan, if all else fails, has always had superb voice casting with many veterans in the industry. The soundtrack, however, hasn't really gotten better over the years. While the special did have inserts, like Unmei no Roulette Mawashite (OP4), and we got a brief intro featuring the very first opening in the series, the background music is still lacking, and has been for years, but at the very least it's well placed. It doesn't sound bad by any means, just that the standard they had set before was so much higher. 9/10 for sound. Given this is basically an introduction episode of sorts, it's hard to rate the characters, but I feel that they have done good and portrayed an accurate personality for pretty much the entirety of the cast, even if showcased in a quick moment. Sonoko wasn't originally in the very first episode/chapter, but her appearance makes sense, and we see a little bit of her personality as a supporting character, because that's really what she does best. It also takes you back to a better time when characters like Ran actually seemed to have personality and weren't really forced to do the same routine after years and years of maintaining the status quo. Fortunately, most the character cameos make sense, and even if you were to watch this as an intro of sorts, I don't feel like it would really spoil that much for you, and it may even shine some light on certain things, or at the very least provide a subtle hint. I think that's a good thing... but I'm still a bit conflicted on some of the scenes, like having the not Detective Boys play soccer and come across Shinichi and Ran. Unless I'm mistaken here, there were only two other incidents where they came across Shinichi, one in the Desperate Revival arc where they didn't know who he was, and they would have probably remembered him after such an impression, and the other when they were preschoolers in a non-canon ova. I don't like contradictions like this in a mystery anime, even if it's just the little things. I'll give the character an 8/10 here, because even though it's Episode One, and a good special, I feel like some things were messed up, it was too convoluted, and Episode One, despite being very memorable was definitely not the best the early anime had to offer. My personal enjoyment of the special was probably the best it could have been. In fact, this is probably my favorite moment all year for the series, be it anime, manga, or movies. With M20 being an upset in that it had nothing to offer aside from being a fan-service film, the manga's slow pace, and the anime being a mixed bag, it was nice to have something that I knew right off the bat I could be on board with. How could they mess it up? Well don't answer that, but thankfully, they did a pretty good job. Overall, I give Episode One a 9/10. 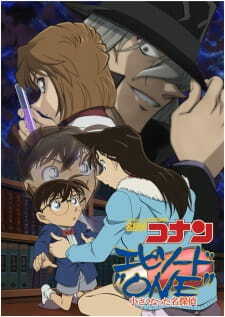 I'd recommend any fan of Detective Conan that has been following the manga/anime to watch this special. Though because there is a certain character reveal, you may want to wait until the UFO case gets animated if you don't read the manga... (That'll be sometime around February 2017, probably). It's nothing significant, and even watching the special here will give a stronger introduction to that character when she reappears, though who knows what kind of impression they'll leave on us over time, or if they are even important at all. First things first, if you haven't watched till around episode 800, do not watch this. This special episode is not for someone who is completely new to the anime (contrary to the title). This is for those who have watched this show in its entirety. And it will spoil a lot, if you were to watch this show. Anyways, here is the deal. To anyone who has been following the anime closely, this is practically a must watch. It hits you right in the feel. That nostalgia, those feels, the pleasure to see Ran and Shinichi goofing around, the time when Ran could smile wholeheartedly, the time when Shinichi was unaware of the threats posed by Black Organization, and then suddenly you realize that he has been carrying this burden for so many episodes that its impossible not to sympathize with him. To go with the usual review process : Art is definitely solid, soundtrack the same (which is quite awesome), characters are Shinichi, Ran and many others, and story though remastered shows a lot of things which couldn't have been shown before. And there are a lot of cameos, A LOT. It was interesting to see how the Black organization was working, and especially in light of recent developments. Nearly every character that has been introduced is probably shown in this 1.30 min special, and this is something that you should not miss. The whole episode is somewhat satisfying I rated it as 9. For me, the overall aesthetic of the narrative and phasing are a bit abrupt, but the sequencing of events are on point and so the story for the whole series became clearer/ clean. I would say that for the viewers of detective Conan who followed it from the very beginning would find this enjoyable and satisfying but for those who dropped the series will find themselves kinda lost. I recommend this episode for viewers who wanted to see a more clean narrative for the main story of the series because we all know that this anime already had more than 800 ep and in between those episodes they revealed an important information that happened before or after the first episode which is critical to the main story.